To accommodate very large audiences in cross-cultural communication, the usual method of simultaneous interpretation with all the necessary equipment may prove too expensive. In its place, Monterey Language Services presents a cost-effective solution that addresses clients’ needs: the Instant Translation method, in which a meeting is presented in one language with an instant translation displayed visually on a screen, or conveniently readable from audience members’ phones, tablets, and other personal devices. MONTEREY, California – March 29, 2017 – This evening Monterey Language Services (www.montereylanguages.com) provided Instant Translation for a Seaside, California meeting with an expected turnout of over 400 attendees. The issues surrounding sanctuary cities have recently become a source of major concern for many of us in California and the country. In order to give ordinary people the chance to have their opinions on this important topic heard, the City of Seaside – not far from Monterey Language Services’ base in Monterey – organized a public meeting devoted to sanctuary cities – with an expected turnout of hundreds of people. This real-time display of translation proved to be a success and made the important content of the meeting accessible to everyone. “Tonight’s meeting is a testament to the method’s suitability for large audiences. When it comes to providing cross-cultural communication for very large audiences, Instant Translation is a time- and cost-effective solution,” says Mei-Ling Chen, Director of Monterey Language Services. The usual method of simultaneous interpretation with a sufficient number of headsets, transmitters, and receivers to accommodate such a large audience proved too expensive. Instead, Monterey Language Services presented a cost-effective solution that addresses the City’s needs: a method that can service a full house without adding extra hours to the meeting’s duration because of language interpretation needs. 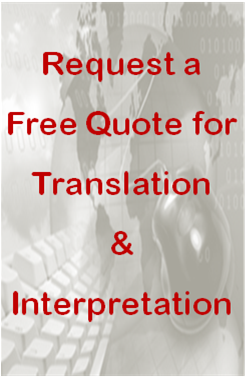 Monterey Language Services is committed to bridging the world’s languages by providing high quality, professional and efficient translation & interpretation services in over 175 languages.